BOSTON — One strike away from a four-hit shutout, David Price happily settled for a complete game and his strongest outing of the season. 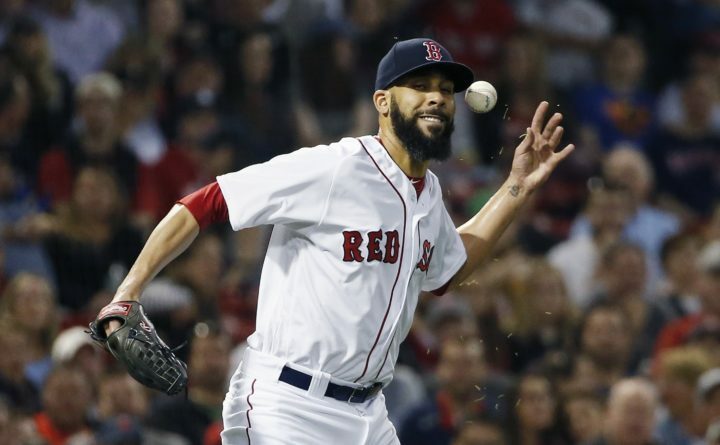 Price struck out eight and held Baltimore to five hits, including two in the ninth when the Orioles broke up the shutout before the Boston left-hander finished them off in a 6-2 victory for the Red Sox on Thursday night. J.D. Martinez hit a two-run homer in the first, and Xander Bogaerts homered with two on during a four-run fifth, giving Price more than enough cushion against the struggling Orioles. Price (4-4) struck out eight and didn’t walk a batter while winning consecutive starts for the first time this season. He cruised through the first eight innings before Andrew Susac led off the ninth with a double, the first Baltimore player to reach second base in the game. Manny Machado spoiled the shutout bid with a two-out homer, but Price finished off Baltimore on Jonathan Schoop’s pop-up to center as the Red Sox improved to 4-0 against Baltimore by taking the makeup game that was rained out on Patriots’ Day. Danny Valencia had a pair of hits for the punchless Orioles, who have lost three of four and have the second-fewest wins in the American League. Valencia nearly had a double in the fifth, but got thrown out at second by left fielder Andrew Benintendi, one of several strong defensive plays that helped Price go the distance. Hanley Ramirez also caught a foul pop on the top step of Boston’s dugout in the second and Mookie Betts ran down a fly ball that was headed to the wall in right. “The defensive plays that I had today, it makes everything a lot easier,” Price said. Kevin Gausman (3-3) went 4 2/3 innings for Baltimore, allowing six runs and eight hits while striking out six and walking two. He was pulled after Bogaerts drove a high fastball out to left with two men on during Boston’s four-run fifth. “We just got into some sticky situations where we just had to dig ourselves out of a hole and we just couldn’t,” Susac said. The Orioles also weren’t happy with the strike zone, which Susac said forced Gausman to throw some pitches the Red Sox pounced upon. Manager Buck Showalter agreed with his catcher. Showalter didn’t wait for Bogaerts to finish running out his home run before making his way to take Gausman out. Bogaerts said he was rounding third when he noticed — and was quite surprised — to see Baltimore’s skipper already on the mound. The Red Sox stole five bases, including one in the fifth when Betts got a great jump with Gausman pitching from the stretch and concentrating on home. By the time Gausman threw a pick-off attempt to first, Betts was more than halfway to second. “He threw over, but you’ve got to step off,” Showalter said. Orioles: Susac got the start at catcher after being recalled from Triple-A Norfolk earlier in the day. The Orioles optioned Caleb Joseph, who was hitting .182 in 24 games with Baltimore. Red Sox: Martinez left the game in the seventh with a stomach illness, the Red Sox said. … 2B Dustin Pedroia (offseason knee surgery) will resume a rehab assignment with Triple-A Pawtucket. Cora said it was possible that Pedroia could make his season debut this month, but needs to get in some innings after just one rehab start so far.